It was with great anticipation, that we welcomed back Dr Robert Saunders of Queen Mary, University of London, after an absence of two years, to talk to us on the vote that took place in 1975, on whether the United Kingdom should join the Common Market. On what proved to be a most interesting talk, so soon after the Brexit vote of the previous year, Dr Robert Saunders, showed how everyone who voted in 1975 to join the Common Market, in 2016 voted to leave the EU, and those who voted not to join the EC in 1975, in 2016, voted to remain in the EU. 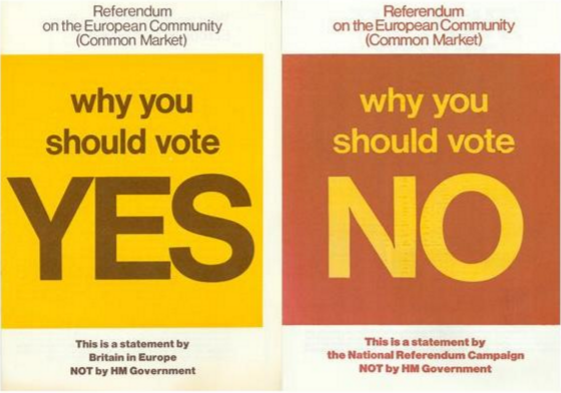 The National referendum of 1975, was the first ever in British history, and the first election in two hundred years, not contested by political parties, ‘drew in’ many different lobbying groups, women’s’ organizations and terrorists organizations. The vote produced a 67.2% majority for joining the EC and a 32.8% no vote. Every part of the UK voted to join the EC except for Orkney and the Shetlands. The UK joined the European Community in 1973. The then Prime Minister, Edward Heath, was the most pro-EC Prime Minister that Britain ever produced. Edward Heath had served in the army during the World War II, and from his experiences, he believed, that the horrors, must never happen again. Edward Heath, wanted to borrow the Bayeux Tapestry, for Westminster Hall, but his advisors reminded him, what the Bayeux Tapestry was about. The legislation, said that the UK would join the EC by the consent of the people and Parliament. Many retailors stocked pro-Europe merchandise, while the national media published articles on the benefit of joining the EC. Northern Irish terrorists published articles, on the effects that the EC have on Northern Ireland. Bishops and the clergy would preach to their congregation the benefits of the EC. Margaret Thatcher campaigned actively for the Yes vote. The Labour party was split. Among the national newspapers, the Daily Express, Daily Mail and Daily Telegraph campaigned on behalf of the yes vote. The Spectator and the Morning Star were the only national periodicals to support the No campaign. The consequences of immigration were not discussed during the campaign, while farming, fisheries and prices were the most popular subjects for debate during the campaign. Both groups of the Yes and No campaign were given £125, 000.00 towards their campaigns. Major companies based in the UK, gave large sums to the Yes campaign. Anytime that, the No campaigners, Tony Benn, Enoch Powell, Barbara Castle and Michael Foot, appeared on television, produced an increase in support for the Yes campaign. Towns and cities were encouraged to set up their own Yes campaign support groups. Surveys showed that women were more likely to vote no. One of the major concerns of the Yes campaign was of the effect on food prices. The 70s were a decade of inflation and high prices. Barbara Castle travelled to Brussels, to buy the same produce as in London, to compare the prices between the EC and the UK. The 70s was also a decade of poor harvests. The Yes campaign focused on the benefits of reliable harvests. The oil price had quadrupled, a 3 day week and shops were running out of sugar. Inflation hit 20%, and Edward Heath warned of economic collapse and rationing, if the country voted no. In Northern Ireland, Scotland and Wales, this was the period, when the nationalist parties, were starting to make inroads, combined with these parties beginning to win parliamentary seats at Westminster. In Northern Ireland, the talk of open borders, added to the tension, between Protestants and Roman Catholics. Ian Paisley publicly stated that the EC was a Papal conspiracy. Sinn Fein opposed the EC, believing in the end of the British involvement in Northern Ireland, did not want to find British rule, replaced by EC rule. In the end, Northern Ireland produced the lowest yes vote.